Hamida Djandoubi smoked a few cigarettes in the last moments before he was executed by guillotine in a Marseilles prison, the ultimate punishment for killing his former lover, Elisabeth Bousquet. “He was young. Very dark hair, neatly styled. His face was rather handsome, with even features, but he was pallid and had dark circles under his eyes. He looked neither stupid nor brutish. Simply a handsome young man. He smoked, and complained immediately that his handcuffs were too tight." The next day, on the other side of the country, the Deauville Film Festival was wrapping up, where a little film later called Star Wars: Episode IV—A New Hope had been celebrating its French premiere. It was September 11, 1977. 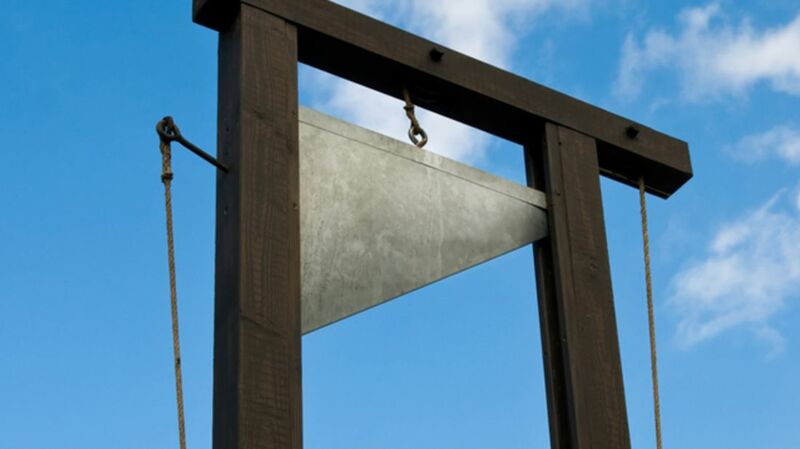 Many people think of the guillotine as being a very antiquated form of execution; all wigs, Marie Antoinette, and the French Revolution. However, the coincidental dates of the final execution and the premiere of George Lucas’s epic space opera make for an uncomfortable reminder that the device, often referred to as the “National Razor,” isn’t such a distant memory. The guillotine was named after Dr. Joseph-Ignace Guillotin, who recommended its use to the French National Assembly in 1789. Guillotin had become frustrated by the cruelty of botched sword and axe beheadings, as well as the differences in execution methods based on class—while nobles were decapitated, commoners could be burned to death or broken on a wheel, much more painful ways to go. Guillotin championed the device, which was actually designed by a Dr. Antoine Louis, in an attempt to provide a more humane form of death to all classes. Perhaps paradoxically, Guillotin was actually opposed to capital punishment. In fact, the doctor was so horrified when the machine became known as the “guillotine” that his family was still petitioning the French government to change its name into the 19th century. Djandoubi's execution on September 10, 1977 was the last in France before Justice Minister Robert Badinter finally succeeded in his crusade to abolish the death penalty in 1981. But the French premiere date of A New Hope isn’t the only connection that the Star Wars saga has to the macabre device. During the last public guillotine execution in France, of German serial killer Eugen Weidmann in 1939, who was in the crowd but a 17-year-old boy by the name of Christopher Lee—who would later go on to play Count Dooku/Darth Tyranus in the series.